Over the weekend, during a Hearthstone tournament, one player lucked into a killer combination not once, not twice, but three damn times in a row, beating the odds in extraordinary fashion. Some context: The player who starts on top, Kitkatz, has a Sneed's Old Shredder, a legendary minion that, when killed, summons another random legendary minion. When the bottom player, Thijs, kills Kitkatz's Shredder, it winds up summoning Kel'thuzad, a legendary minion with the ability to revive dead friendly creatures at the end of each turn. When those two cards are combined, some insane things can happen—the Kel'thuzad will just keep reviving the Sneed's, which can just keep dying and spawning new legendary minions. Fortunately, Thijs was able to take out that second Sneed's Old Shredder, which turned into... another Kel'thuzad. 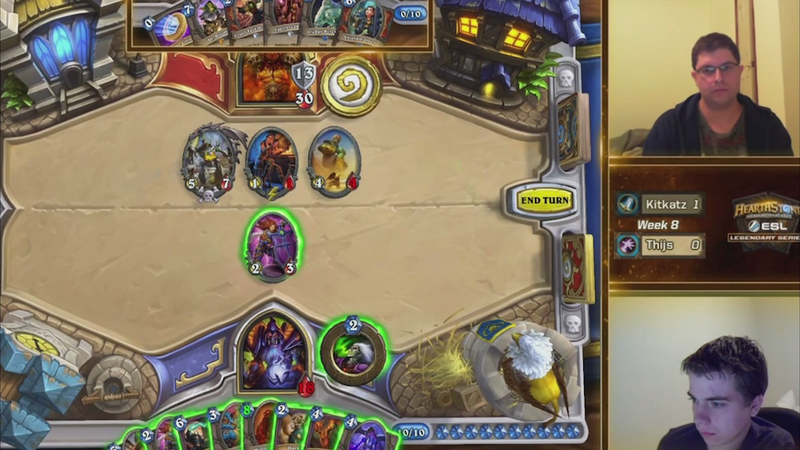 At that point, Thijs just gave up and left. Unbelievable. Given that the odds of getting a Kel'thuzad are 1/62, the odds of doing this three times in a row are 1/238,328, or 0.00041%. Maybe it was a bug... or maybe we should get Kitkatz to a casino, stat.